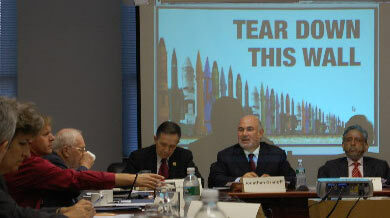 On 11-12 October 2009, PNND held its Annual Assembly in New York. This included a conference on The Role of Parliamentarians in advancing nuclear abolition, and the Annual PNND Council meeting. It also included a special PNND Council Dinner with guest of honour the Rt Hon Helen Clark (Head of the United Nations Development Program and former Prime Minister of New Zealand) and a meeting with UN Secretary-General Ban Ki-moon. The PNND Assembly included UN officials, government representatives, disarmament experts and parliamentarians from Belgium, Bolivia, Brazil, Canada, Costa Rica, Czech Republic, France, Germany, India, Japan, Malaysia, New Zealand, Romania, Scotland, Sweden, the United Kingdom and the United States. Topics of discussion included How to Engage the Nuclear Weapon States, the role of non-nuclear states in multi-lateral negotiations, Reducing reliance on extended nuclear deterrence, Moving towards a cooperative European security regime, the role of Nuclear-Weapon-Free Zones in advancing nuclear non-proliferation and disarmament, Divestment from nuclear-weapons corporations, National legislation to abolish nuclear weapons, President Obama’s vision for a nuclear-weapons-free world, and Implementation of the UN Secretary-General’s five-point plan for nuclear disarmament. The PNND Council Meeting appointed the incoming Co-Presidents and Council. We thank the outgoing members for their service to the organization. We welcome the incoming and continuing members and congratulate them for their appointment. At the PNND Council Dinner, guest of honour Helen Clark commended PNND for its effective work engaging parliamentarians in key nuclear non-proliferation and disarmament issues and initiatives. Ms Clark also commended PNND for recognizing the links between disarmament and sustainable development, noting that just 10% of the annual $1.4 trillion global military budget could fund the Millennium Development Goals of adequate food, fresh water, health care and housing for the world’s population. (See PNND Co-President’s statement on disarmament for development). Ms Clark welcomed the new environment for nuclear disarmament provided by President Obama’s vision and actions for a nuclear-weapons-free world and encouraged PNND to continue its work to help realize this vision. 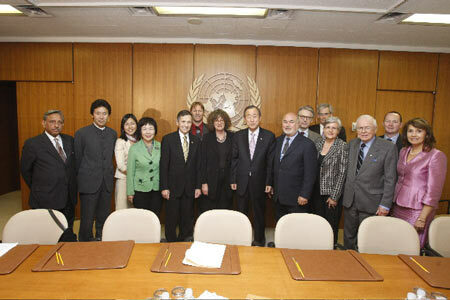 At their meeting with UN Secretary-General Ban Ki-moon PNND Council members discussed his five-point plan for nuclear disarmament, parliamentarians actions urging governments to reduce the reliance on nuclear deterrence, and proposals for regional security including nuclear-weapon- free zones. 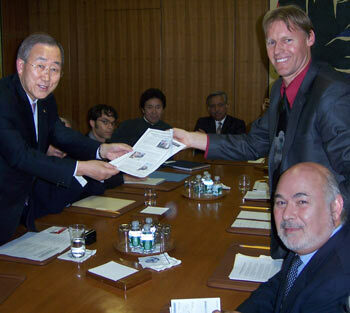 The meeting included a presentation to the Ban Ki-moon of the Parliamentarians’ Declaration Supporting a Nuclear Weapons Convention (a core component of his five-point plan), and a Parliamentarians’ Statement in Response to North Korea’s Nuclear Weapons Test, which included support for the Comprehensive Test Ban treaty and the proposal for a North-East Asian Nuclear Weapon Free Zone. PNND thanks the Malaysian Mission to the United Nations and the Bahai Centre for providing the venue and facilities for the Assembly and Council Meeting. PNND also thanks all those members and experts who travelled to New York specially for the Assembly.